The main measure of UK inflation turned negative in April for the first time on record, with the rate falling to -0.1%. It is the first time Consumer Price Index (CPI) inflation has turned negative since 1960, based on comparable historic estimates, the Office for National Statistics said. The biggest contribution to the fall came from a drop in air and sea fares. Bank of England governor Mark Carney said he expected inflation to remain very low over the next few months. But Mr Carney added that "over the course of the year, as we get towards the end, inflation should start to pick up towards our 2% target". The latest inflation figures show that transport costs were 2.8% lower in April than the same time a year ago, while food was 3.0% cheaper. Chancellor George Osborne said the inflation figure should not be mistaken for "damaging deflation". He added that the lower cost of living - driven by last year's fall in oil prices - would be a welcome relief for family budgets, in an environment in which average wages were finally beginning to rise. Media captionChancellor George Osborne: "Negative inflation is not damaging deflation"
"Of course, we have to remain vigilant to deflationary risks and our system is well equipped to deal with them, should they arise," Mr Osborne added. Shadow chancellor Chris Leslie said: "Any relief for households is welcome, but this month's figures reflect global trends and [that] doesn't change the reality that many are still struggling to pay the bills. "The government must clearly guard against the risk that business investment might be deferred. We need stronger action now to raise productivity to deliver sustainable growth and rising living standards." The latest inflation figure means that a basket of goods and services that cost £100 in April 2014 would have cost £99.90 in April this year. The last time CPI inflation was negative, according to estimates by the ONS, was March 1960, when prices were 0.6% lower. The last time we saw a price fall in the UK was March 1960, before even I was born, when there was a drop (probably) of 0.6%. So my natural impulse is to say that deflation has arrived in Britain - because there is no other word in the English language than "deflation" to describe this phenomenon. However many of those who define themselves as "serious economists" (that's not me, by the way - I'm a hack) are desperately anxious that I and you don't use the "d" word - for two reasons. One is that they say proper deflation is a long term term trend of declining prices, and they believe - almost certainly correctly - that these current price falls won't endure much more than a month or two. The other is that proper deflation is pernicious: if we believed that prices were set to fall month after relentless month, we would spend less - in the hope of picking up bargains later - and our bosses would pay us less. Inflation as measured by the Retail Prices Index (RPI) in April remained unchanged from the month before at 0.9%. Ian Stewart, chief economist at Deloitte, said the fall was "likely to prove short-lived and positive for growth". "Falling prices raise consumer spending power and help keep interest rates low. This looks like the mild and benign variety of deflation, which is good news for consumers and for growth," he said. Andrew Sentance, senior economic adviser at PricewaterhouseCoopers and a former member of the Bank of England's Monetary Policy Committee, said he did not expect the fall in prices to be sustained. "Once the impact of the big drop in oil prices drops out of the annual inflation rate, it will move back up to 1-2% over the next year or so. With wage inflation picking up, we may soon be considering the prospect of above-target inflation," he said. "In the meantime, flat or slightly falling consumer prices are good for growth, boosting real consumer spending power. 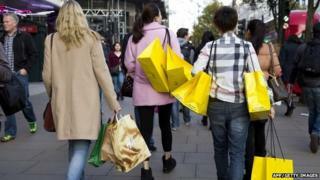 So a temporary period of slightly negative inflation can be good for the UK economy." Almost nothing changed between March and April's inflation figures. The ONS says that the thing that did move, which was the price of air fares and sea fares, was depressed by the timing of Easter. The prices that are used to calculate the CPI are collected in a few days in the middle of the month. In 2014, Easter fell during those days, which meant transport fares were inflated. This year it didn't, so fares were lower, which means today's tiny deflation may be seen as a technical effect.